Helps apply the research findings of behavioral neuroscience to daily life. Neil Carlson, U Mass Amherst -- Professor Emeritus at the University of Massachusetts, Amherst, Neil Carlson's research has focused on the relationship between the brain and behavior—specifically, the role of the limbic system in learning and species-typical behavior. Dr. Carlson received his undergraduate degree and Ph.D. from the University of Illinois. 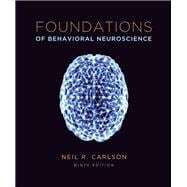 In addition to writing Foundations of Behavioral Neuroscience, Dr. Carlson is also the author of Physiology of Behavior and co-author of Psychology: The Science of Behavior. Dr. Carlson's books have been translated into Spanish, Italian, Portuguese, German, Hebrew, Japanese, Chinese, and Korean.